At this point, everyone probably knows that gReader is my RSS client of choice on Android. Of course, everyone should also know that I love pretty apps. I'm actually a sucker for a clean, minimalistic layout, and will often choose what looks better over what's actually functional. Maybe I'm just vain. Whatever the reason, though, when I laid eyes on Press, it was an insta-buy for me – it's just so pretty I couldn't resist. Turns out it's quite functional, too. Win/win. But I'm getting ahead of myself. 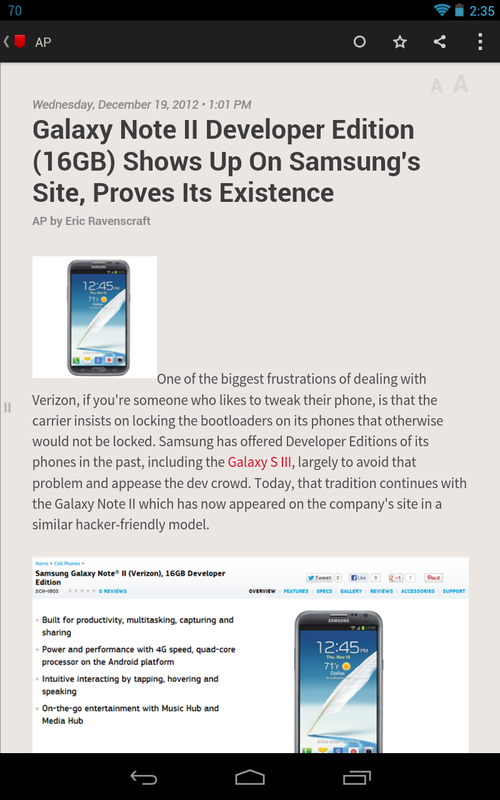 Basically, Press is a very nice looking RSS reader for Android. 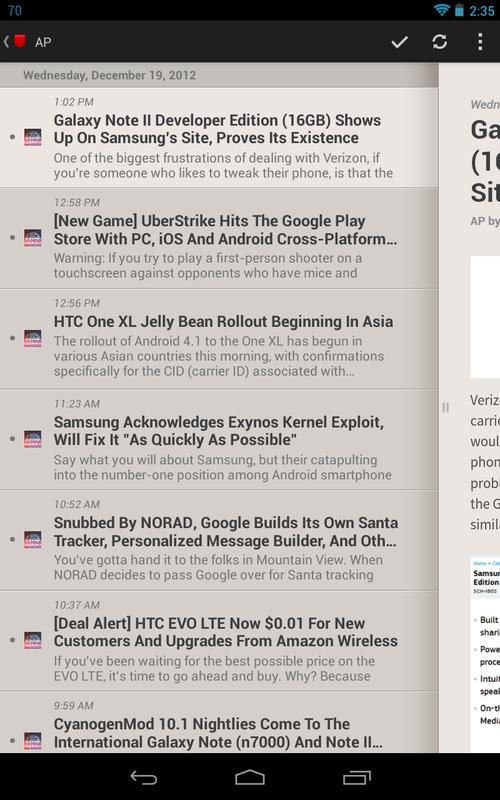 It does things that most RSS readers do, like sync with Google Reader, for example. And it to does it all in a very clean package. Did I mention it's pretty? I seriously can't stop looking at it. 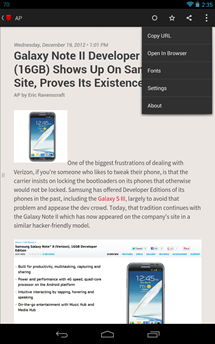 Note: The background color actually shows up darker in the screenshots than it does on the device. 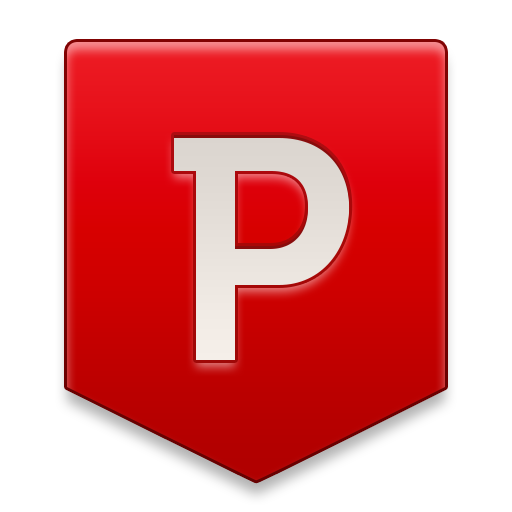 It's not just another pretty face, though – Press offers some really nice features to go along with its simplistic approach to reading. For example, if you long-press the favicon in the unread list, it gives you the option to mark everything below the selected article as read. That's awesome! 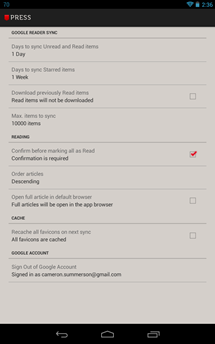 Of course, you can also mark everything as read with the checkmark, too. 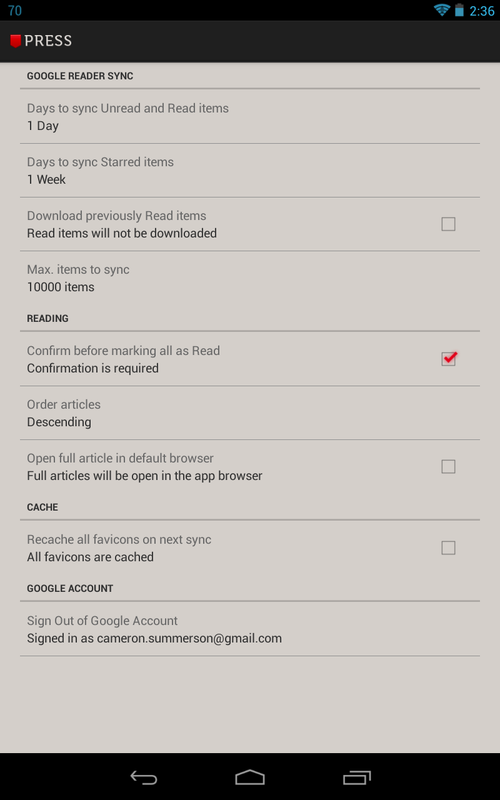 Otherwise, it's pretty cut and dry: the pages are swipe-able, you can customize how many days worth of feeds are download, the maximum number of items to sync, and the order in which the articles are display. You can also change the font – don't like the stock choice? No worries, there are five others to choose from. At $2, I say Press is well worth the money, even if you just casually read RSS. Heck, it's actually a good reason to start reading RSS if you don't already.